Eddie MacDonald powered to victory in the Pro All-Star Series (PASS) opener at Thompson Motorsports Park’s Icebreaker on Sunday. As a result of winning the second qualifying heat on Saturday, Eddie Mac started the 75 lap feature from the outside pole position in the EXIT Realty Beatrice Associates/Grimm Racing Chevy and quickly established his dominance. 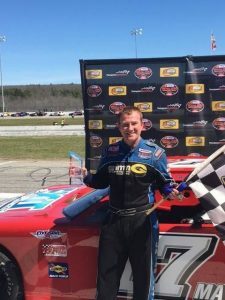 Eddie Mac will compete next in the K&N Pro Series event at Bristol Motor Speedway on April 22, and then fly back early the next morning to race in the ACT Governor’s Cup 150 at his family owned track, Lee USA Speedway in Lee, N.H. on Sunday, April 23.